I love dashboards. I love Raspberry Pis (tiny $35 computers the size of a set of playing cards). And I’m cheap frugal. I found a 24″ old LCD at Goodwill (a local thrift shop) and bought it but it’s been sitting unused in my garage. Then I stumbled on DakBoard. 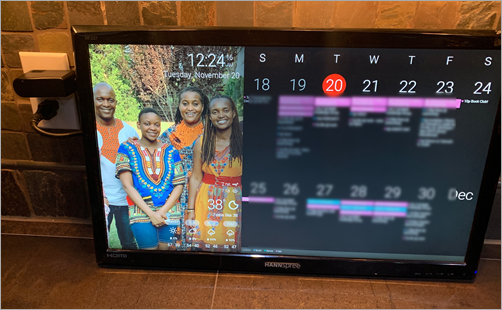 The idea is simple – A wifi connected wall display for your photos, calendar, news, weather and to-do. It has to act like an appliance. If you are messing with it to keep it alive, it’s not an appliance, it’s another computer to manage. It has to just work. If my Spouse doesn’t like the idea or find its not reliable, the SAF (Spouse Acceptance Factor) will be low and they’ll want to get rid of it. All it takes is one “why isn’t this working” and I’m dead in the water. Finally – What do you want to show? You’ll want to ask yourself, is this just an iPad on the wall? I’d propose not. In fact, I’d say this is a Wall Mounted Glanceable Display – a personal dashboard – not an interactive thing. I want the family and kids to just stop by, note important information and move on. It’s also worth pointing out the a horizontal monitor on the wall looks like, well, a monitor on the wall. But somehow when it’s Portrait it’s dramatic. It’s not something we are (yet) used to seeing. I may try this out in a few ways, or even make a few of these displays! It’s pretty easy! I used the DakBoard Blog but I had most of the stuff already. Get a $35 Raspberry Pi 3. The 3 is fast and includes Wifi so you don’t need an extra adapter. I like a 2.5A powersupply but some folks say you can run the Raspberry Pi off the monitor’s USB power – IF that power can put out at least 1A. 500mA will likely cause instability. It depends on if you want to try to get the whole thing down to one power cable. Cheap SD Card – 8 gigs is fine, but get whatever works for you. This doesn’t need to be awesome. A 1 foot HDMI cable. You’re gonna mount the Raspberry Pi to the back of the monitor and hide it so you want the cable to be as small as possible. And finally – a 24″ ish (smaller is fine) LCD (IPS is nice) monitor with smallish bezels and HDMI inputs that go out to the side (NOT directly out the back) as you want this flush on the wall. Think about how you’ll mount it. You can take the back off the monitor and use hanging wire OR use a flush VESA mount. Then you make sure that Chromium starts up full screen, the mouse is hidden, and we’re looking at the dashboard! It’s super important you don’t have to touch it. It’s an appliance, right? My family uses Google Calendar (GSuite) to manage hanselman.com, but I use Outlook at work. I also have a lot of business/work crap in my calendar that the family doesn’t need to see. So I have two problems here, filtering, and appointment movement between Work and Home. My wife and kids use Google Calendar and it’s their authoritative source. My work calendar is MY authoritative source, so I want to sync Outlook->Google but ONLY including Personal/Podcasts/Travel categories. I categorize in Outlook at work, and then those appointments that are appropriate for the family calendar get moved over. 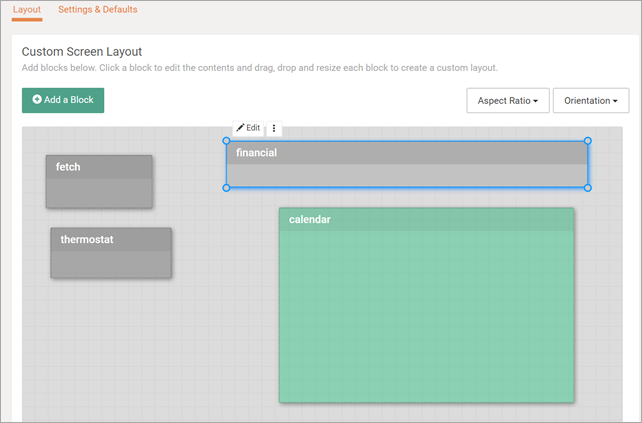 Then the Family Calendar dashboard includes color coordinated items for Mom, Dad, Kid1, Kid2. The kids include homework that’s due as appointments. GOTCHA: I have been using Google Calendar for YEARS. I have also been using sync tools like this for years. As such, I was noticing that sometimes DakBoard would timeout asking for my Google Calendar’s ICS file. It would take minutes. So I requested it myself and it was 26 megs. It’s clear that Google calendar doesn’t care deeply about iCal and that’s disappointing. This could easily be solved if they’d support some kind of OData like URL-based query for fromdate=, todate=. 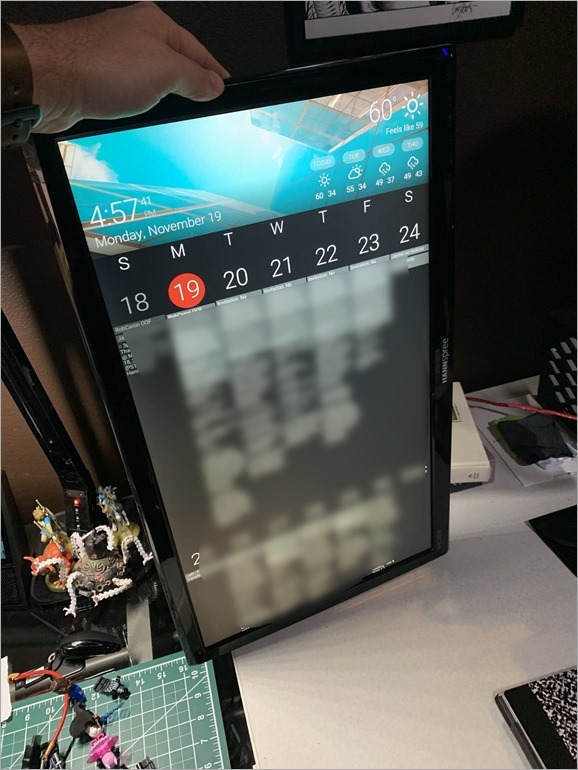 In this case, the DakBoard was getting 26 megs over and over to just show a few weeks of appointments. I literally had appointments from 2005 in the calendar. I decided that since I’d declared Outlook my authoritative source for my calendar that I’d take an archive (one time snapshot) of my iCal and then delete all my calendar items from Google Calendar and re-sync, one way, from the authoritative source, going back 1 year. I’m likely a rare case but it’s worth noting in case you bump into this. All in all, this can easily be done in a short few hours if you have a Pi and a monitor. The time will be spent making it “sanitary.” Making the cables perfect, hanging it on the wall, hiding the cables, then tweaking the screen to be perfect. DakBoard has a free option that works great, or a Premium subscription that gives you even more control. Again, it depends on your web/art ability, and your patience. This is a fun new world that I’m excited to get involved with and my family is already stoked about this new display as we enter the holiday season.